First up in the list is this modestly priced offering from Schecter; their C-7 Deluxe range 7 string in a crisp Satin White. 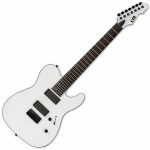 For whatever reason, Schecter have massively underpriced this axe at just and with the specs we’re about to outline below, you’ll wonder why too. 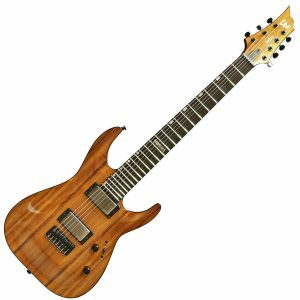 The ideal 7 string guitar for beginners looking to dip their toes into the world of metal and the possibilities that come with an electric seven string, the Schechter comes with a basswood body, a 24 fret rosewood neck, 2 signature Schecter diamond pickups and a tune-o-matic bridge. 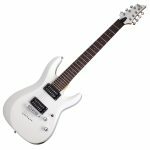 Definitely the best seven string guitar for beginners, the C-7 is not one to be missed at a great price. Fans with a knowledge of metal players and a love for mind-bending shredding will no doubt have heard of Michael Angelo Batio. The MAB7X is a classic 7 string from his signature range, modelled exclusively for fast playing and metal riffs and endorsed by one of the true legends of shredding himself. With a ‘C’ profile on the maple neck for ease of access to the 24 frets, a Floyd Rose locking tremolo system and 2 DMT Design humbuckers that really pack a punch, the Batio MAB7X is massively under-priced and an absolute steal for lovers of metal and guitarists looking to hone their speedy chops. 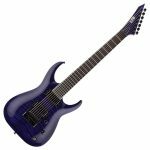 Ibanez have always been a brand associated with creating iconic axes, and their take on seven (and even eight string) guitars have introduced to the world some of the best guitars for metal, heavy rock and shredding. And, at a modest price, this Ibanez seven string is certainly no different. With a set of Quantum Pickups, a maple top (quilted), Wizard 3 neck profile and 24 frets on the maple neck, the Ibanez S75 is primed and ready to handle all of the metal playing that you can throw at it. We recommend this as a beginners seven string, or a great all-round guitar for live events and gigging. 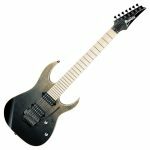 Another brilliant mid-range axe which is massively under priced, the glossy black Jackson SC Seven String is a slick looking axe with even slicker features. Boasting impressive characters such as a set of custom Jackson Pickups, a Dark Rosewood Fretboard and an impressive mahogany body over an arched top. This guitar is a steal and makes for a great introductory guitar to learning metal, rock, and electric guitar for beginners. It’s also one of the more common shapes that you’ll see in this list, so it makes sense to go after this seven string if you’re looking for a classic shape with that added extra. Normally associated with razor-sharp guitars and axes with mind-bending aesthetics (double neck MAB Guitar anyone? 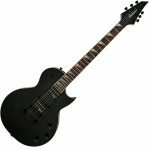 ), Dean have introduced the thoroughbred series to offer an alternative stance on the classic rock guitar shape, tone and style. The Stealth 7 string is crafted in solid mahogany, an ‘ultra Access’ C neck that is a common feature on Dean Guitars, and a set of active EMG 707 Pickups which are widely regarded as the best pickups for metal guitar. This is certainly a step up from the mid-range seven strings in the list, but if you’re serious about investing in a seven string with quality hardware, electronics, and one that looks simply awesome, then give the thoroughbred a go. Taking another look at the latest ranges of classic-rock guitar inspired seven strings, the ESP LTD range has taken a turn towards the styling’s of Fender, and their TE-417 certainly does not disappoint. With a snow white mahogany body, active EMG humbuckers that provide both a low-end growl and a high-end jangly Telecaster-esque tone, finished with a maple x rosewood neck combo, the ESP LTD TE offers an amazing alternative to lovers of metal and rock guitar that need that little bit more from a Strat, a Tele, or any of the old classic guitars. With the added seventh string, this truly is an excellent all round seven string electric. Many Telecaster players are often searching for something a little bit heavier, but their stock pickups just don’t carry through. ESP have very clearly addressed those concerns with their construction of the TE-417, and we think they’ve done an absolutely brilliant job. Now, this is the seven string guitar to end all seven strings. 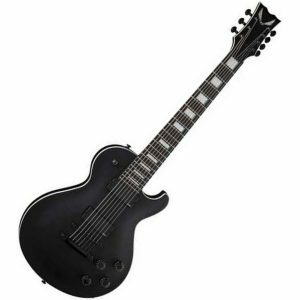 The ESP LTD ‘1007B is a baritone electric guitar, meaning that the low ends are extra-low, and can be handled perfectly. With EMG 7HX Metal Pickups, a 5-piece maple neck, 24 Jumbo Frets, and an Exotic Hawaiian Koa veneer top finish, this is the final axe in the list and our all out favourite. 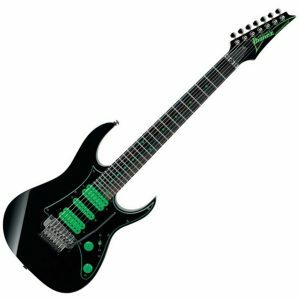 It might be the highest priced on this roundup , but rest assured that if you want to learn metal guitar, or if you take your metal and rock guitar playing seriously and want to add that extra edge, then this is definitely the guitar for you. Get a load of this beauty! When people think of a Steve Vai seven string, or even an Ibanez seven string, many will think of this. Clearly a look back to the Passion and Warfare days, this beautiful axe from the Vai/Ibanez duo is not one to be missed out on. With only a few in stock at any one time, if you can managed to catch this (and you’re a fan of 80’s inspired, retro axes) then you can’t miss out on this! A maple/walnut neck, retro green and black colourway, and signature Dimarzio Blaze Pickups (to name but a few points), the UV70P is fairly priced as a limited axe, and to be honest we actually thought it’d be more expensive. 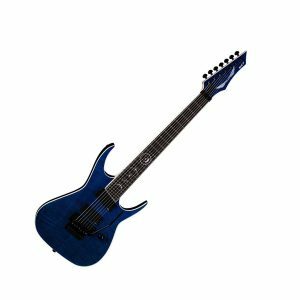 Prices and stock are subject to change, so if this is the seven string for metal you’ve been looking for, then you have to snap this one up ASAP. We all love a natural guitar. There’s something so satisfying about a stripped-back axe, whether that’s because we love to imagine the journey a pre-worn axe has been on, or if it’s just that the no-fuss minimalism of a stripped-back, natural seven string is just simply refreshing (in a world of black metal axes), it’s always a nice addition to add. Recently picked up by many jazz lovers across Instagram, we’ve seen a huge surge in light, natural finish axes, from jazz and blues players to metal lovers and more. So let’s have a look at what else makes this guitar so special. Part of the Dinky series, the DKA7M features an ash body, arch top, 24 jumbo frets and Seymour Duncan humbucker pickups which certainly pack a punch. For a versatile seven string guitar, the Jackson DKA7M is definitely worth a look! Hands up if you’re sick of seven string guitars in block, dark colours? Not exactly a common problem, but for true seven string fans we totally understand. The RGPCM is a premium seven string in the Ibanez RG collection, finished in a stunning ‘Twilight Black’ gradation. Starting with a lighter tone at the top, the natural finish blends with the light fretboard to gradually diminish across a yellow spectrum, to a black at the bottom of the guitar. But enough about the amazing colour; what features does it have? The RG7PCMLTD comes with a modern 11-piece wizard-7 neck, a sturdy ash body and maple top, with DiMarzio PAF 7 pickups that really pack a punch. 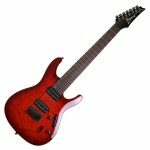 A modern seven string guitar for the modern guitarist, you’ll be hard-pressed to find a better all-rounder when it comes to a seven string for all genres. A firm favourite when it comes to seven string brands, Dean are certainly no stranger to providing guitars for metal across the spectrum of genre, price, and even stunning limited edition and signature ranges which rival any other brand. One such guitar is the signature Rusty Cooley Dean 7 string, in a unique ‘Trans Blue’ finish. Completely developed with the style of signature playing approach of Rusty, if you’re a fan of his music and style (and want to replicate it with a modern seven string) then here’s an axe to certainly not look past! 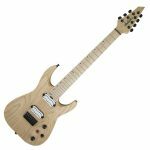 Features include EMG 707 pickups (awesome pickups for seven strings and metal guitar players), a mahogany body, flame maple top and classic rosewood fingerboard. All in all, an amazing axe. The final guitar in a list, and one of the most recent seven string guitars released just at the end of 2017 in preparation for 2019 metal seven string lovers, the ESP LTD SH-7 is another beautiful seven string in their signature range. Also one of the most expensive on our list, this guitar is definitely one to get on your christmas list, so you can spend all of 2019 mastering a well-rounded seven string guitar from a reputable brand. With features including a basswood body, maple neck, evertune bridge and diverse Fishman humbuckers, this is easily a signature guitar for the ages. Fans of Korn and Brian Welch can not miss this one! If you’re looking to learn guitar for nu-metal and replicate that low, growly sound, then this is the seven string guitar for you. Now you’ve got the guitar, you’re going to need some accessories too. 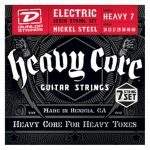 To save you looking through pages and pages of seven string accessory products, we’ve highlighted our favourite must-haves and most practical seven string guitar products. Check them all out below. We can talk about seven string guitars until we’re blue in the face (and we’re partial to rambling), however you’re going to need to hear what the guitar sounds like eventually right? 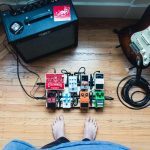 Rather than share demos to every guitar in our list, we’ve picked out the top 5 demos for our overall favourites. Happy listening! 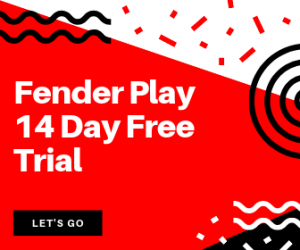 When it comes to seven string guitars, you can read as many reviews as possible, but without knowing the reason you want to get one (and the history behind the seven string guitar) then you are simply buying blind. 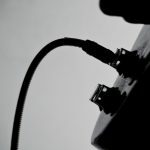 With this being said, we’ve compiled a list of the most frequently asked sevens string guitar questions, with detailed answers to provide you with more information around the subject of the seven string. What is the main difference between a six and seven string guitar? 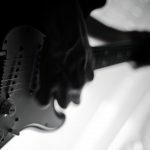 The neck of the guitar tends to be flatter, generally resulting in a neck and overall tone which is much more suited to carrying the lower notes of the low b string. The overall sound of the guitar is heavier, due to the addition of the lower string. This is why seven string guitars are a firm favourite of metal guitarists, as the heavy tone is guaranteed with the added 7th string. A 7 string guitar will have greater tension within the strings, therefore detuning and general varied tuning options are easier to carry out (especially detuning in comparison to a 6 string guitar). Should I choose a 6, 7 or 8 string guitar? Generally speaking, if you are a beginner you should start with the classic 6 string guitar. The standard 7 string has an added lower B string, and the 8 string guitar tends to have an added lower B (like the seven string), and another string beneath that B tuned to an F#. 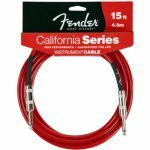 This is however at the discretion of the manufacturer, and you may find different models with different tunings and string additions. Why do metal players choose 7 string guitars? 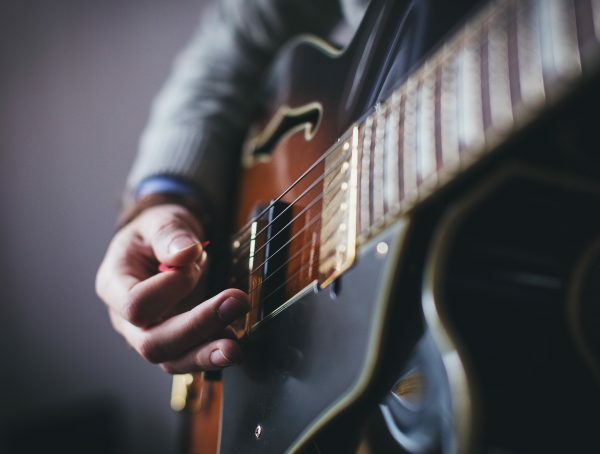 Ever since the rise of nu-metal and bands such as Deftones and the rap metal of Limp Bizkit, seven string guitars have exploded in popularity across the guitarist scene. 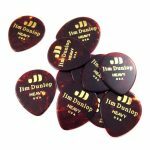 Metal players gravitate towards seven string guitars because of the added B string, and the fact that detuning and odd tunings can be experimented with ease, whilst the guitar maintains its string tension, action and tone. What is the standard tuning of a seven string guitar? What other common tunings are used? These are standard drop tuning options and work brilliantly for metal songs and heavy rhythm sections. 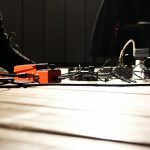 Can you use 6 string accessories with a 7 string guitar? Generally, yes you can. 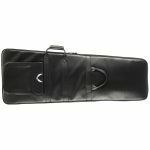 7 string guitars usually fit into standard gig bags, and can be used with accessories such as slides and capos alongside any 6 string guitars you may have. 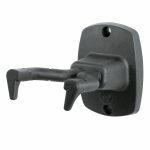 We’ve included accessories purely for 7 string guitars in the section above. Who makes the best seven string guitars for the money? Liked this post? 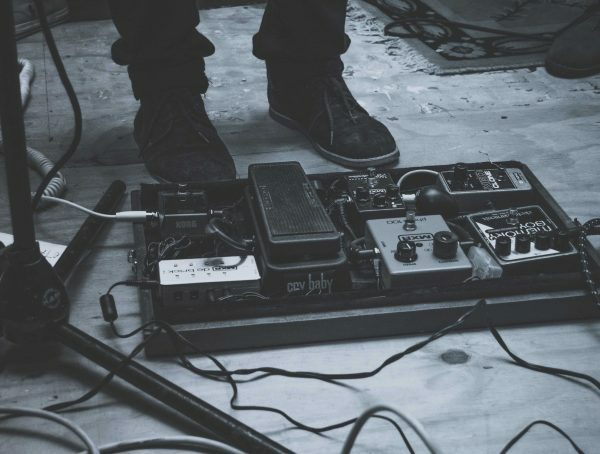 Make sure you don’t miss our ultimate overdrive & distortion pedal guide.